If you are running for State Representative, State Senator, Executive Councilor, or Governor, you can take the Anti-Broadbased Tax Pledge any time. Once taken, there is no need to take it again, as your Pledge never expires, unless you rescind. The Pledge (current list for 2018 is updated daily with date inside, filename is 7-7-2018) against broad-based taxes includes a general income tax, general sales tax, or, an increase in a current broad-based tax such as rooms and meals, etc. Simply send an email to jane@cnht.org with your name and office held or sought and you will be added to the list. You can add your campaign website for listing, or, and email address where voters might contact you to ask questions. You may use the graphic pictured on the left. Simply CLICK HERE to download a larger copy which you can sign, rescan, and display on your website or use in mailing materials. There is no need to return the actual sheet to us. We have now uploaded the latest list of Pledgers for 2018. It will be updated each day from now until the primary. Elected officials can take the Pledge any time. 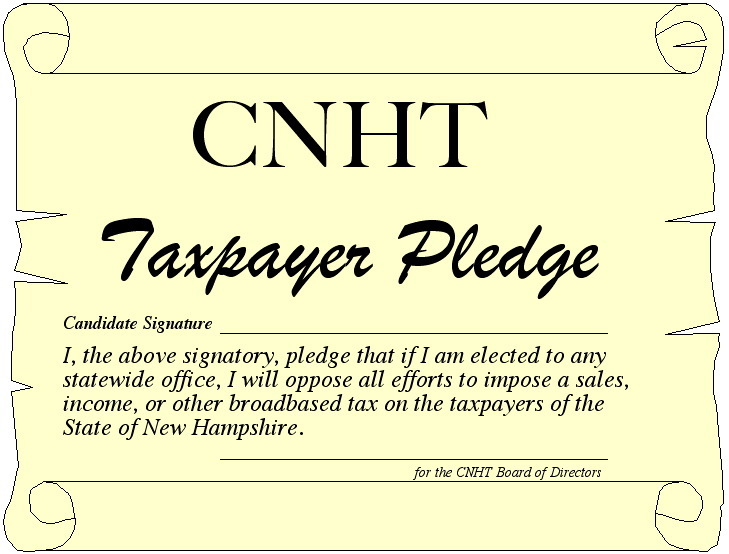 Please note that the Pledge is NON-partisan and thus candidates running as R, D, and I are invited to make this promise to the taxpayers. WE WILL ATTEMPT TO CONTACT ALL CANDIDATES EITHER BY EMAIL, FACEBOOK, OR VIA GENERAL INVITATION POSTED IN NUMEROUS PLACES. If you are a voter, and the candidates or current officials from YOUR district are NOT on the list, please contact them and urge them to take this important Pledge! All candidates are listed on our Pledge Sheet for 2018, but you might want to nudge those in RED to take it too!